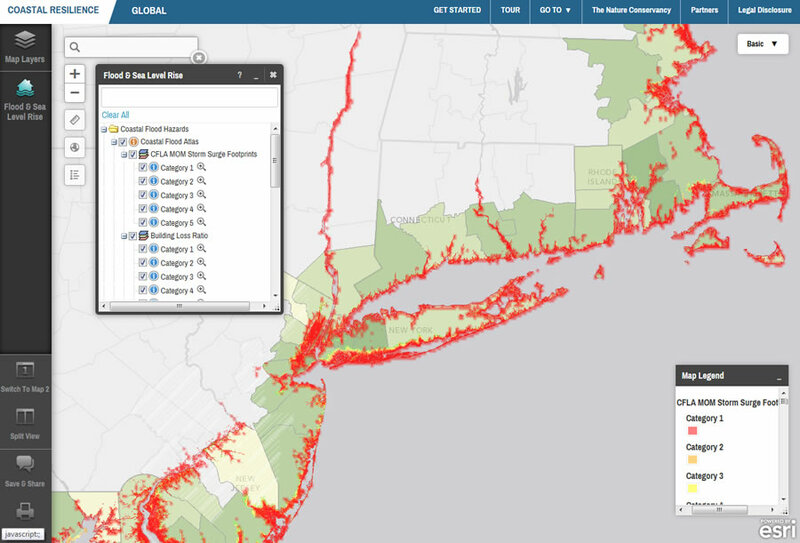 Web mapping services from the Federal Emergency Management Agency (FEMA), USGS, and NOAA were integrated with Coastal Resilience data to help users assess risk and vulnerability to flooding and sea level rise across the eastern seaboard of the United States. 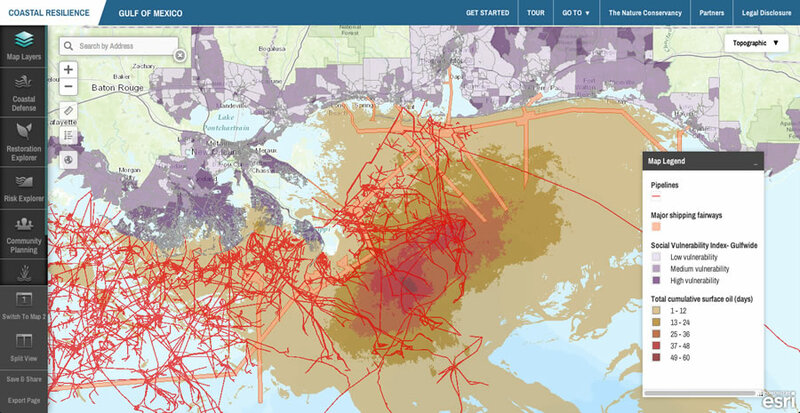 Thanks to a suite of online mapping decision support tools built by The Nature Conservancy and powered by the ArcGIS platform, government agencies and other organizations can examine how to prepare for and respond to storm surge and flood damage. The Coastal Resilience platform and suite of applications were introduced in 2008. Since then, they’ve been used for actual disasters big (Hurricane Sandy) and small (coastal erosion in the Puget Sound region of Washington). Coastal Resilience helps users assess risk and vulnerability to storm surges and erosion along the coastlines of the United States, Mexico, and Central America and in the Caribbean. It also gives them ways to identify how to restore damaged or eroded land and adopt new techniques to protect vulnerable communities. Local and regional government officials, as well as the general public, can use the Coastal Resilience to respond to and prepare and plan for changing climate conditions and coming disasters. Coastal Resilience was used for long-term recovery and restoration planning after the Deepwater Horizon oil spill. The suite of tools helped to understand relationships between vulnerable offshore infrastructure and coastal communities. So far, using Coastal Resilience, The Nature Conservancy researchers have looked at how to solve different coastal management challenges, like flooding and coastal erosion. Researchers are able to emphasize nature-based alternatives, like tidal marshes and oyster beds, instead of seawalls and other man-made infrastructure. Deployed on the web, Coastal Resilience can be reproduced for looking at other specific coast-related issues easily. In 2010, Coastal Resilience was used to look at saving coastlines in Louisiana, Florida, and Alabama after the Deepwater Horizon oil spill. Almost five million barrels of oil spilled for 87 days, impacting 68,000 square miles of ocean and destroying wetlands, marsh grass, and coastal sand. To help bring back balance to the natural habitats and restore commercial fisheries, The Nature Conservancy and its partners developed an oyster restoration decision support app as part of Coastal Resilience in the Gulf of Mexico. This app, called Restoration Explorer, allows stakeholders to examine ecological and socioeconomic factors when restoring reefs. The app includes a suitability index that was assembled using ArcGIS Spatial Analyst. Since oysters can only survive in water that is just right for them—at a particular depth, temperature, and salinity, for example—the index was created to weight cells on a raster surface with these factors for realistic restoration scenario planning. The factors can be changed depending on what is more important to the user when identifying potential restoration sites. This app can be freely used by organizations that want to study scenarios for restoring oyster beds by going to the website and following the prompts. First, select a region: Alabama, Mississippi, Louisiana, Florida, or Texas. Then, move sliders from low to high to change different ecological and socioeconomic variables. If searching Mississippi, variables such as the current oyster reef, salinity, and historic oyster reef scores or the percentage of people employed in construction and natural resource industries in that area are available to study. The variables change according to the region. 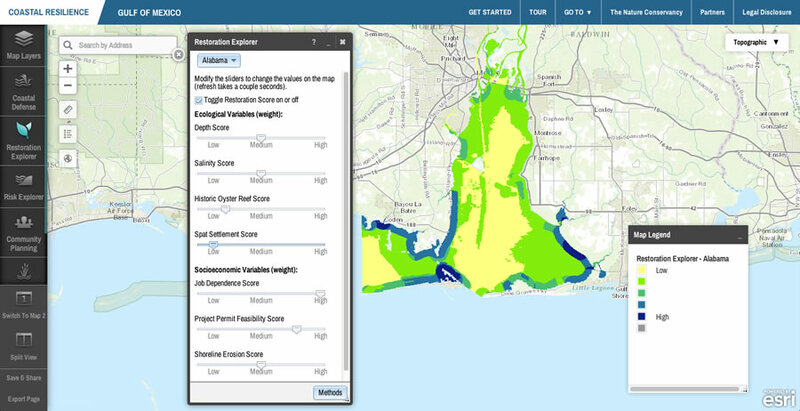 By weighting social, economic, and ecological factors, the Restoration Explorer app dynamically updates a map to support oyster reef restoration suitability in Mobile Bay, Alabama. As the variables are modified, the coastal regions that meet the criteria are highlighted. A description of the different variables and scientific methods used is available by clicking the Methods button on the main pop-up menu. Even after the Deepwater Horizon oil spill, the app continues to be a tool to restore oyster beds along the coastline of the Gulf of Mexico. A project called 100–1,000: Restore Coastal Alabama uses the app to identify 100 miles of oyster reefs in Mobile Bay, Alabama, that will be restored and promote the growth of 1,000 acres of tidal wetlands. The project is related to legislation, called the RESTORE Act, enacted specifically to assist coastal Alabama after the Gulf oil spill. 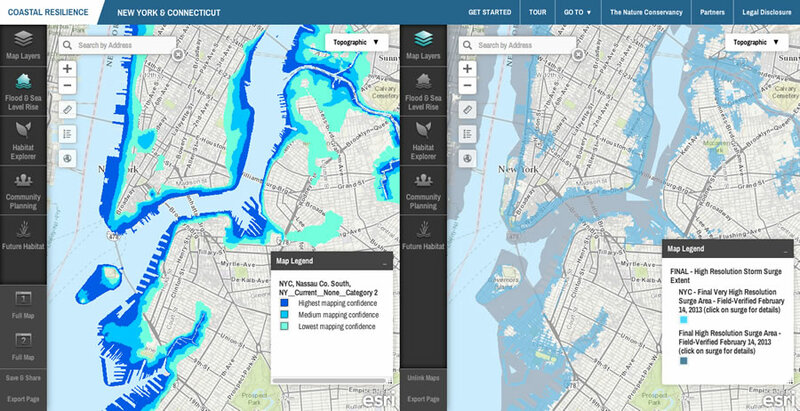 Comparing modeled storm surge (left) with the FEMA flood inundation layer from Hurricane Sandy, users can visualize which emergency and hazard mitigation models have a higher level of accuracy and confidence. The Coastal Defense app has been used in locations such as Puget Sound, Washington, and at various locations in the Gulf of Mexico. Coastal watershed planners have used the app to reduce the risk of flooding by employing less invasive natural defenses such as marshes and oyster beds instead of creating man-made barriers. Planners can model whether to use man-made dikes (gray infrastructure) or natural marshes (green infrastructure) using the app. They are able to place infrastructure at a certain location along the coastline on the map and analyze the amount of energy in waves. Looking at different current and future scenarios in the app allows planners to find the most cost-effective and protective measures and determin where to implement green and/or gray solutions for the best outcome in protecting coastal communities. Coastal Resilience is now available in 10 US states: Florida, Alabama, Mississippi, Louisiana, Texas, New York, Connecticut, New Jersey, California, and Washington; Central America: Mexico, Belize, Guatemala, and Honduras; and the Caribbean: Grenada, St. Vincent and the Grenadines, and the US Virgin Islands. 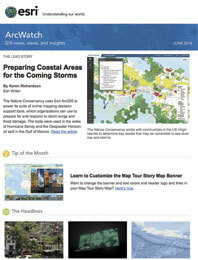 There are also global and US national web maps that together form the Coastal Resilience network. These and other stories can be found at http://coastalresilience.org. For more information, e-mail coastalresilience@tnc.org.